Regarding the supervision of the church, we teach that no one should publicly teach or preach or administer the sacraments in the church without a call issued in a regular and orderly way. The eventual titles given to this article were “Vom Kirchenregiment” (German) and “De ordine ecclesiastico” (Latin). The former refers to the management and supervision of the church, i.e. who is responsible, humanly speaking, for directing and running the church. The latter refers to the structure and setup of the church, i.e. how its work should be carried out in an orderly way. Many Roman theologians accused the Lutherans of rejecting the public ministry and all order and authority in the church because of works such as Luther’s Concerning the Ministry (1523; Luther’s Works [AE] 40:3ff), in which Luther taught the priesthood of all believers. Melanchthon could not have answered that false accusation more clearly or concisely than he does here. For proof passages, see Jeremiah 23:21; Romans 10:13-15; Ephesians 4:10-15; 1 Corinthians 4:1; 14:29,36-40; Titus 1:5. Today such calls are issued by God through the church; see Matthew 18:19,20; Acts 1:15-26; 6:1-6; 14:23 (where “had elders elected” is the best translation; see Martin Chemnitz, Examination of the Council of Trent, Part 2, Topic 9, Section 4, §12). 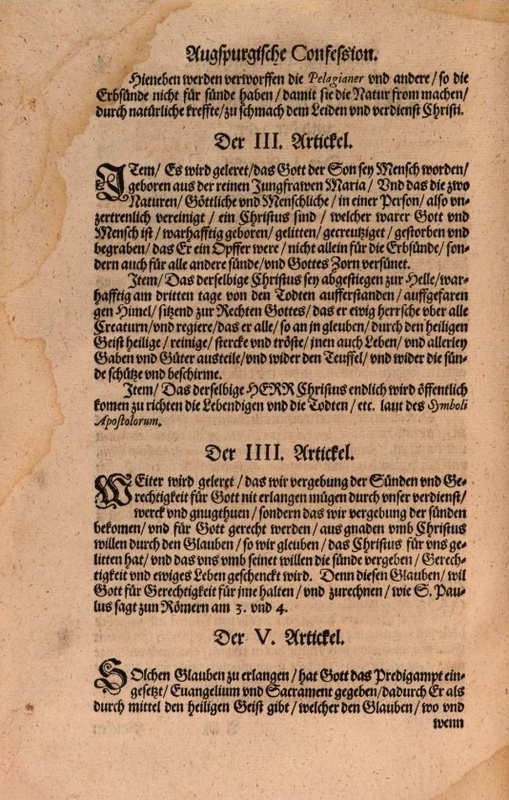 1 Melanchthon’s first edition (editio princeps) reads: hat Gott das predigampt eingesetzt / Evangelium und Sacramenta geben. 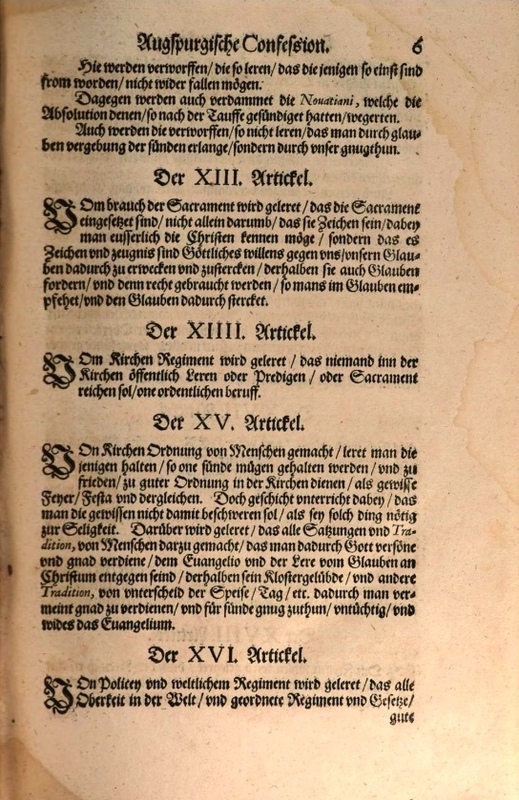 The 1580 Book of Concord (pictured) reads: hat Gott das Predigampt eingesetzt / Evangelium und Sacrament gegeben. While both basically end up in the same place doctrinally speaking, there is a slight difference in meaning between the two. In the first, the second clause expresses the means by which God instituted the ministry of the Word – “[by] giving the gospel and sacraments.” Or to paraphrase: “God gave the gospel and sacraments, and in so doing he instituted the ministry of the Word.” In the second, the second clause is epexegetical to the first – “that is, has given the gospel and sacraments.” While Luther and Melanchthon definitely upheld the institution and importance of the clergy (see e.g. Article 14), it is equally as clear that they did not understand “the ministry of the Word [das Predigtamt]” as something synonymous with or rooted in the clergy. 3 By the time this article was penned, Melanchthon (and to a greater extent, Luther himself) would have had a number of people in mind with this condemnation, including, but not limited to, Caspar Schwenckfeld, Thomas Müntzer, Nicholas Storch, Melchior Hoffman, Hans Denck, Ludwig Hetzer, Balthasar Hubmaier, and Ulrich Zwingli (on Zwingli, see here). Luther generally labeled people who believed that God operated outside of his Word and the sacraments, or communicated additional truth to themselves or others outside of his Word, Schwärmer or Rottengeister – fanatics or rabble-rousers. Anabaptist (German: Wiedertaufer) means “one who baptizes again,” a label that referred explicitly to the rejection of infant baptism and the resultant practice of being re-baptized as an adult. For more on the Anabaptists, see note 3 under Article 9. The idea now occurred to me of becoming a minister [Diener] of the Church myself, even if only as a teacher. I carried the idea around with me and couldn’t get rid of it. I sought refuge in prayer. Over at the edge of the woods stood a white ash, behind which I knelt down and prayed that God would please remove the idea from my heart, because I was unfit. Daily, often several times, I went to find my prayer altar, but the idea only grew more and more intense. Finally I opened up about it to my brother-in-law Auch. He advised me against it at first, because, in fact, I did not have the gifts necessary for becoming a missionary, and being a missionary’s assistant was too unstable. He furthermore cited the fact that I did not have the educational background for such studies, and that I also did not have the means. In all these points he was absolutely correct. Instead he now made me this proposal: “Stay with us. We have no children. You’ll be like our very own.” He offered me a horse as a gift, a young and beautiful animal, and – get this – he told me he had 700 dollars available, if I’m not mistaken, and that he wanted to lend it to me without interest as long as I wanted. I should use the money to acquire some land. The land on which they were living and the surrounding land was school property and would soon be for sale, 50 cents an acre. In five years there would be a small town here, he said, and I could then resell the acres for 100 dollars apiece. He had purchased 40 acres at the mouth of the river in order to cut off the speculators. The Indians were prophesying an abundant whitefish harvest in the fall. He said I should buy myself a “bag net,” hire a man, buy barrels and salt, stretch the net across the creek in the evening and pull it out full in the morning. Out in the distance, a mile or so away, were two small little islands; a ship could moor along one of them. I could take my fish there with our boat and get three and a half to four dollars a barrel. And actually the promised catch of fish did turn out to be so abundant that a Frenchman and his assistant caught 1200 barrels full off of Fish Point, which is what they called a promontory not too far from the mouth of the river. What he said about the small town also came true. “Thousands!” I thought. “This way you can become a fairly rich man without a lot of work. Do it!” But I didn’t accept right away. I now often ran back to my white ash, but the more I prayed, mostly to be rid of the idea of studying, the more fervent the idea became. I packed my bundle. Meyer’s wife was also there. When it was time to go, they both cried and I did too. Brother-in-law Auch brought the group to Saginaw by boat. Then I headed to Frankenmuth on foot. I had a professor in college who had “Des Pfarrers Predigt an sich selbst” on his office wall. To those who had any sense for German, he loved to point it out and watch them read through it all the way to the end, especially the last line. “Isn’t that just the neatest thing?” or “Doesn’t that about sum it all up?” he would then tell them. And they knew it did, even though they didn’t necessarily catch all of it. It is one of those poems that is at once something for the young pastor to aspire to and something only the experienced pastor can fully appreciate. It will be a long time before I have the experience necessary to appreciate it in full, but I pray that it is scanned by at least a few pairs of eyes belonging to pastors who do.